I’m a big fan of souvenirs. If I travel somewhere I’ll pick up something small, like a magnet (bonus if the magnet doubles as a bottle opener) so I can stick it on my fridge and be reminded of a happy place when I’m getting some eggs, broccoli, or a bottle of wine. But sometimes the best souvenirs aren’t magnets or anything like what you can find in a touristy shop (which I’m a total sucker for). I think the flavors of the places you’ve traveled to provide great memories of where you’ve been and even better is recreating those flavors at home. My family and I recently returned from a vacation in beautiful Puerto Rico. When we planned the trip some time ago, I thought it would be a nice spring break for my sons, from New England’s long winter, and the norm of work and school. The plan was to have lots of relaxing beach time. And we absolutely did. Our first day there we found that chilling can be exhausting. We had woken up fairly early for our flight and basically headed straight to the beach after checking into our hotel. Hours of swimming, laying on a lounge chair while enjoying piña coladas, and literally not being on the go mentally and physically was a new concept for me. By dinner time we were tired and a little hungry – but not hungry enough to commit to a full meal (those piña coladas can be filling). 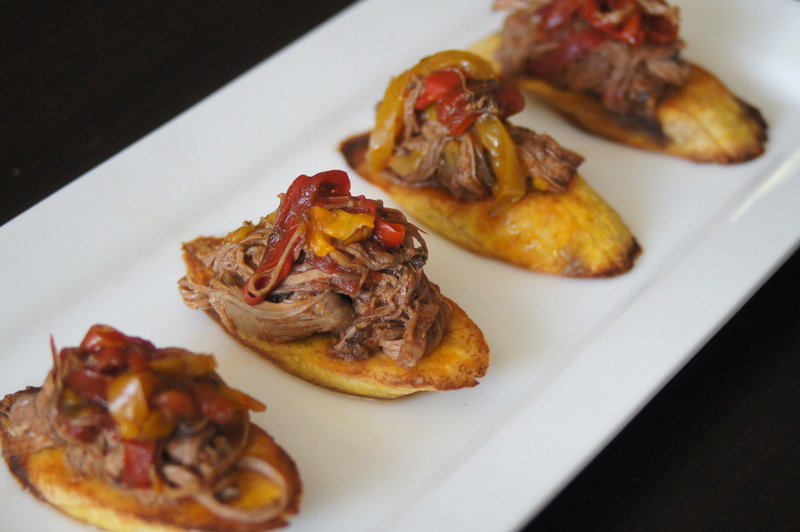 The Ropa Vieja reminded me of Juli Bauer’s recipe on PaleOMG. I’ve made it before and loved it. Easy to make and most importantly – so flavorful. That’s essentially how I feel about all the recipes I’ve made from her site and cookbooks. There really isn’t any one of her recipes that I’ve tried before that left me feeling meh about. Seriously, check out her website (www.paleomg.com) and be amazed! I followed her recipe exactly here, except I didn’t add the capers since my family aren’t big fans. But I did add the brine from the capers so technically they still make an appearance. I also slow cooked it for about eight hours. When I went to shred the beef it fell apart perfectly. And really, if something is going to fall apart, shouldn’t it be done perfectly? Add your onions and peppers to the bottom of the crockpot. Place the chuck roast on top and cut 4 deep slices into the chuck roast and push your garlic cloves into the roast. Add all your spices and salt and pepper. Then add your tomato sauce, diced tomatoes, capers, and bay leaf to the rest of the crockpot. Place on low for 6-8 hours. Once your ropa vieja is done cooking, shred your beef with two forks in the crockpot. 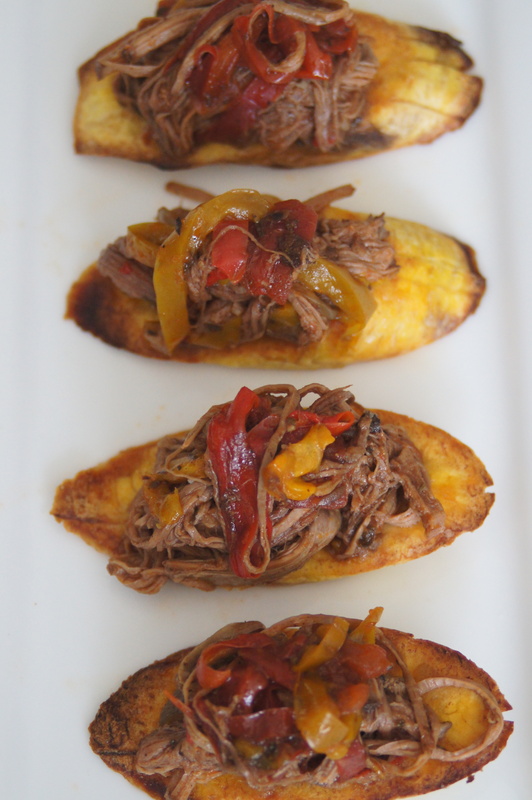 Serve ropa vieja alongside or on top of baked plantains. 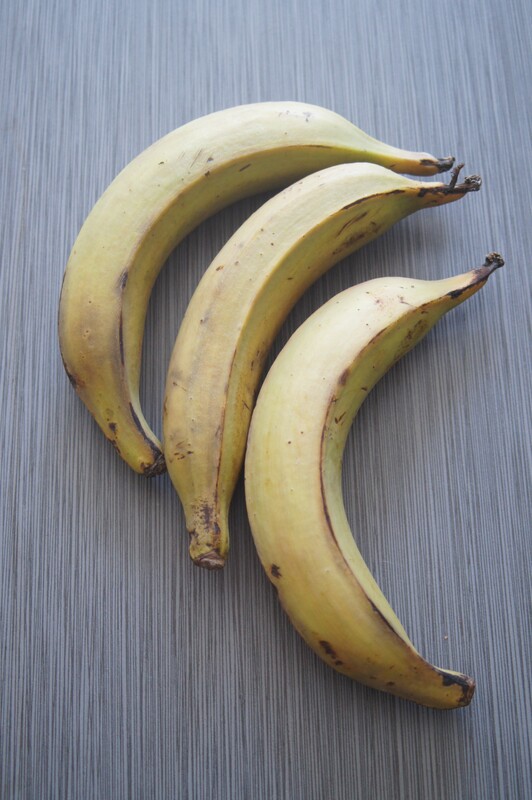 Peel the plantains by slicing a slit into the skin, but not deep enough to cut the plantain. Cut the plantains on the bias and place on a cookie sheet. Toss with enough of the coconut oil or grapeseed oil to cover. Sprinkle with salt and place the plantains in a single layer. Bake on one side for 10 minutes. Turn the plantains over and bake for another 10 minutes until both sides are golden brown. Sprinkle with more salt if needed.